Early Earth provides multiple examples of other kinds of habitable planets very different from our modern world that may help to guide interpretation of observations of planets elsewhere in the galaxy. VPL research has generated major advances in understanding our early planet. The Earth Through Time research area combines geological and biological data with ecosystem and climate models to help us determine how Earth’s environment has changed throughout its history. By constraining parameters like surface temperature, atmospheric pressure, and composition, and determining corresponding biogeochemical cycling and greenhouse effects, we can explore a range of ecosystems dominated by many different metabolisms very different from those found on modern-day Earth. Since life co-evolves with its environment, the coupled study of life and its environment throughout history may provide insight into ancient habitability and the possibility of life on other worlds. VPL has already contributed significantly to our understanding of this long-term co-evolution of the Earth and its biosphere, including the development of tools that we are continually improving. We have developed photochemical models (e.g., Zerkle et al., 2012, Claire et al 2014), atmospheric escape models, weathering models (Bolton et al., 2006), climate models (Roberson et al., 2011), spectral models of the ancient Sun (Claire et al., 2012), and coupled biology-nutrient cycling models (Claire et al., 2006). Together, these models allow us to constrain the likely biological productivity and climates of these environments, and simulate planetary spectra that are self-consistent with these environments and metabolisms. We have used these models to interpret various Archean environments, including a haze-rich Mesoarchean and Neoarchean atmosphere (Domagal-Goldman et al., 2008; Haqq-Misra et al., 2009, Kurzweil et al 2013, Claire et al 2014, Izon et al 2015, Arney et al 2016), the “faint young Sun” paradox in the Proterozoic (Roberson et al., 2010), and biological productivity in the Archean (Claire et al., 2006; Kharecha, et al., 2005). Geochemical constraints on the early Earth environment are necessary to construct models and understand the habitability of our early planet, and VPL has led the community in many aspects of these efforts. We have worked to understand the alkalinity of Archean lakes (Stüeken et al 2015a) and the redox state of ancient seas (Stüeken et al 2015b). We study how ancient life operated, too. For example, VPL research has considered when oxygenic photosynthesis evolved (Buick et al 2008) and when oxygen's first traces hit the atmosphere (Anbar et al 2007, Krissansen-Totton et al 2015), VPL research shows how nitrogen isotope evidence indicates organisms were able to use atmospheric N2 as a nitrogen source as early as 3.2 billion years ago (Stüeken et al 2015c). We also study nitrogen from the perspective of a bulk atmospheric gas: studies of fossilized raindrop imprints have provided constraints on the total Archean atmospheric pressure (Som et al 2012, Kavanagh et al 2015). Paleomagnetic analyses suggest that atmospheric circulation patterns at 3.5 billion years ago were similar to today, and ancient Earth had a dipole magnetic field (Bradley et al 2015). The study of Earth’s history provides us with a variety of plausible environments and metabolisms to consider, and by simulating planetary spectra for these unique cases, around stars of various spectral types, we can begin to catalog a range of biosignatures we may potentially detect with exoplanet characterization missions such as JWST and TPF (see also Tasks D and E). VPL has pioneered studies on the potential for organic haze in the Archean atmosphere. Understanding atmospheric haze on our planet is important because hazy Archean Earth may be the most “alien” world for which we have geochemical data. The Archean haze would have profoundly affected our planet’s environment with impacts ranging from cooling of the climate to acting as a possible UV shield for surface life. 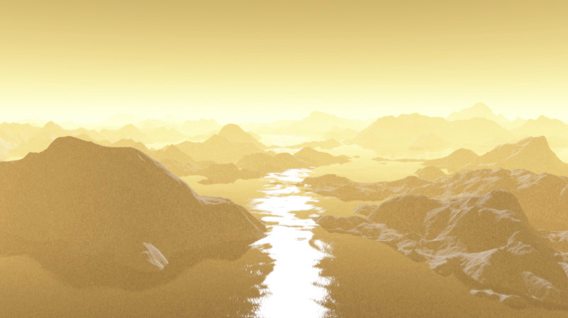 An artistic depiction of haze in the Archean atmosphere. VPL researcher J. Haqq-Misra led a study on the weakened greenhouse potential for methane on Archean Earth (Haqq-Misra et al. 2008) due to its ability to form haze at CH4/CO2 ratios approximately greater than 0.1. Another pioneering study of Archean haze was led by VPL researcher S. Domagal-Goldman, investigating the coupling of haze to sulfur isotope signatures in the geologic record (Domagal-Goldman et al. 2008). Subsequent studies involving VPL team members have sought geochemical evidence for this haze. The seminal study by Zerkle et al. (2012) uncovered correlations between sulfur isotopes and organic carbon isotopes from sediments collected from the Ghaap Group in South Africa, suggesting an important connection between these sulfur signatures and biogenic methane production. Subsequent photochemical analyses by Kurzweil et al. (2013) and Claire et al. (2014) have given us a more detailed look at how sulfur photochemistry can be impacted by an atmospheric haze, and additional geochemical evidence collected by Izon et al. (2015) has expanded the links between sulfur isotopes and biogenic methane over multiple geological cores over multiple locations, suggesting global impact of haze in the late Archean. More recently Arney et al. (2016) performed a new study of the impact of fractal haze on the habitability and spectrum of the planet, and these updated results suggest that hazes are not incompatible with habitable surface temperatures. The spectral signatures of such a haze are strong, both in reflected light and transit transmission. VPL researchers have led the way in understanding nitrogen on Earth from biochemical, geochemical, and observational perspectives. Nitrogen is a key nutrient for all life on Earth, but the process by which N2 in the atmosphere is converted to forms used by life forms is complex. A major breakthrough came when E. Stüeken, R. Buick, and colleagues (Stüeken et al. 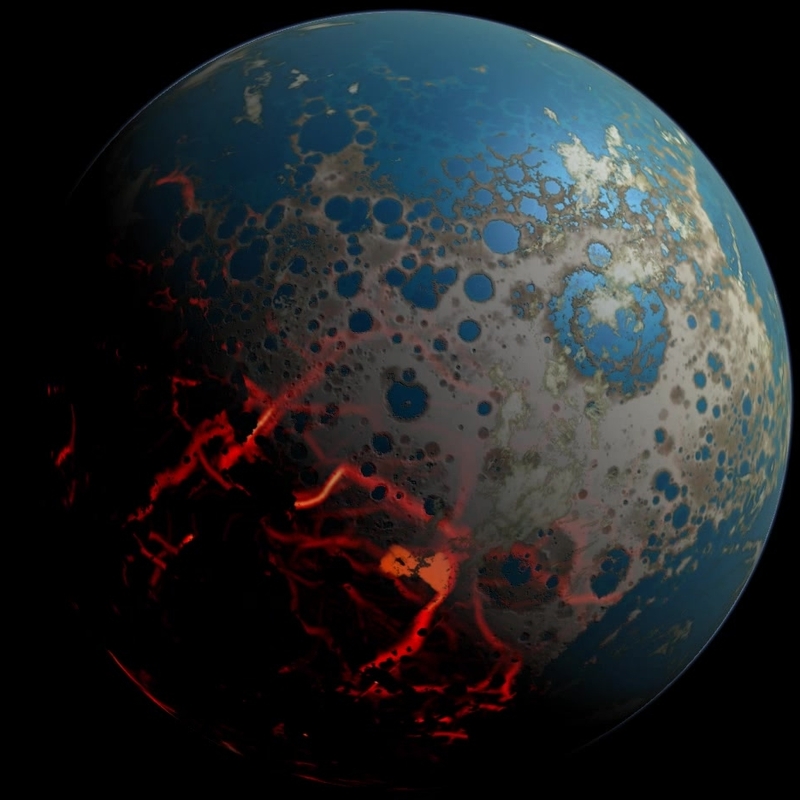 2015c) analyzed N isotopes in Archean sediments and showed that the processes by which biology incorporates nitrogen had evolved as early as 3.2 billion years ago. This study is synergistic with a separate work by E. Stüeken, R. Buick, and colleague (Stüeken et al. 2015a) showing that Archean lakes were likely alkaline environments based on nitrogen isotope data. The VPL team's work on biological nitrogen incorporation has significant implications for the amount of N in Earth’s atmosphere. Studies by VPL members have provided critical insights to the total amount of nitrogen in Earth’s ancient atmosphere. Studies of fossilized raindrop imprints have placed constraints on the total Archean atmospheric pressure (Som et al 2012, Kavanagh et al 2015). Finally, we have examined the nitrogen content of the bulk Earth in Johnson et al. (2015), concluding that the bulk silicate Earth contains roughly 7 times the present amount of atmospheric nitrogen. Images of fossilized raindrops analyzed by the Som et al. study. VPL members have led the field in understanding how trace elements leave big clues about the ancient planet’s environment. 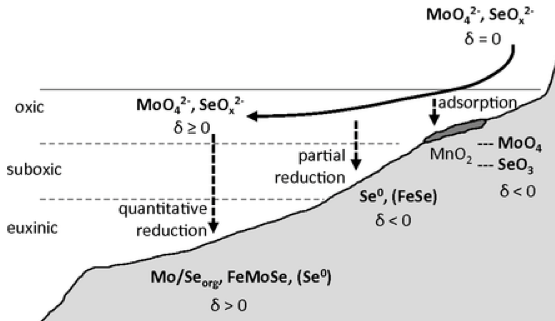 A spike in selenium weathering support a brief “whiff” of oxygen during the Archean prior to the “Great Oxygenation Event” (Stüeken et al 2015d). This has implications for atmospheric chemistry, continental weathering, and the chemistry of the oceans at the time. This has led to work on the ability of selenium to participate in novel biosignatures species and participate in a global selenium cycle (Stüeken et al 2015b). A vitally important trace element for life on Earth is phosphorous, and research involving VPL member R. Buick reports on the occurrence of phosphite in Archean marine carbonates, suggesting that this species was an abundant component of the oceans before 3.5 billion years ago (Pasek et al 2013). VPL members have also been involved with important work considering sulfur isotopes as indicators of past environments, particularly in respect to possible Archean hazy intervals (Kurzweil et al 2013, Farquhar et al 2013, Claire et al 2014 Izon et al 2015). A schematic of the proposed selenium cycle from Stüeken et al 2015. The team published two papers (Goldblatt and Zahnle, 2011a and 2011b) that studied the effects of clouds on the early Earth’s climate. This is relevant to the "faint young sun paradox,” which is the juxtaposition of expectations that the sun was dimmer early in Earth's history with geological evidence for a climate at least as warm as today's. One of the largest uncertainties in models of this time is clouds which could have caused either warming or cooling on early Earth. We conducted a major parametric study, in which we fully explored the phase space of changing clouds, understanding their radiative forcing and allowing objective evaluation of the forcing from various hypothesized changes to clouds (Goldblatt and Zahnle, 2011a). For example, we responded rapidly (Goldblatt and Zahnle, 2011b) to a high profile proposal by Rosing et al. (2010) that less low cloud would resolve the faint young sun paradox, showing that this was not quantitatively plausible. We also showed that a long-standing assumption in early Earth climate models that clouds could be neglected from the atmosphere and replaced with an enhanced surface albedo leads to a systematic over-estimate of the strength of greenhouse gas forcings. 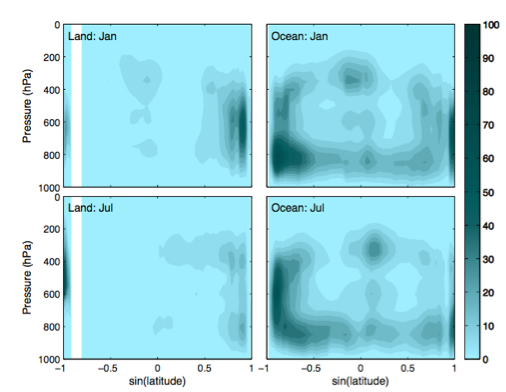 A spin-off application of our work on Earth was in astronomy; we were able to show that representing clouds in brown dwarf stars as having partial coverage (cloudy and cloud free sub-columns in a single-column model) gave a much better fit to observed spectra than existing models (Marley et al., 2010). Average cloud fraction as a function of latitude in the Goldblatt and Zahnle (2011) model. Darker areas (closer to 100) hare more cloud coverage.